Tiny Tips for Library Fun: Aaaargh! Five Years Old! Aaargh-some! Aaaargh! Five Years Old! Aaargh-some! 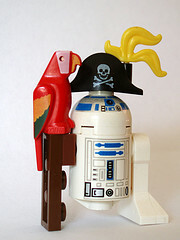 I'm celebrating Talk Like a Pirate Day today - and the blog's fifth anniversary! What a fast year - hard to believe it's already time to celebrate such an argh-picious occasion! When I looked back last year, it was with amazement and surprise at how the blog has grown. Only a year later, and the pageviews for the blog have gone up over to 83,000 views (from 32,000 over the first four years!). That astounds me. Thank mateys for sticking with the blog and being part of my library family online. It means the world. Now back to plank-walking! Well congratulations, Matey!I always look forward to reading your blog.